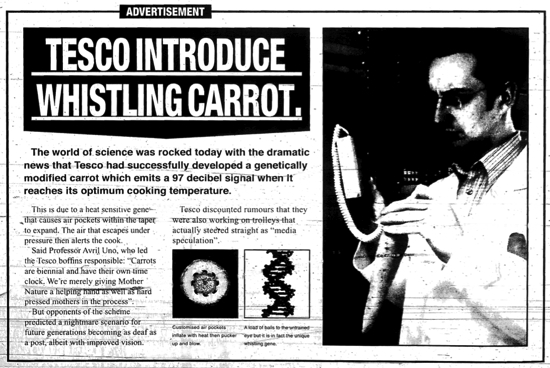 The British supermarket chain Tesco published an advertisement in The Sun announcing the successful development of a genetically modified 'whistling carrot.' The ad explained that the carrots had been engineered to grow with tapered airholes in their side. When fully cooked, these airholes caused the vegetable to whistle. The world of science was rocked today with the dramatic news that Tesco had successfully developed a genetically modified carrot which emits a 97 decibel signal when it reaches its optimum cooking temperature. This is due to a heat sensitive gene that causes air pockets within the taper to expand. The air that escapes under pressure then alerts the cook. Said Professor Avril Uno, who led the Tesco boffins responsible: "Carrots are biennial and have their own time clock. We're merely giving Mother Nature a helping hand as well as hard pressed mothers in the process." But opponents of the scheme predicted a nightmare scenario for future generations becoming as deaf as a post, albeit with improved vision. Tesco discounted rumours that they were also working on trolleys that actually steered straight as "media speculation." Tell me where I can buy some of these carrots! None of our three local grocery stores sell them, and I need them so my kids will eat carrots! "whistling carrot"...yeah, that's what my girlfriend calls it. This just goes to show how stupid people can be, Whistling carrots really.... Does anyone know where I can get some..
Now if I can just get me some whistling spaghetti. I have this bad habit of over-ccoking it.